Maggie Kerper came to college interested in science, but really developed a passion for the field after taking her first college-level science classes. After transferring to Notre Dame as a sophomore, she decided to find ways to explore science outside of the classroom. As part of the Harper Cancer Research Institute, the Littlepage lab studies breast and prostate cancers and aims to understand the mechanisms of cancer progression and identify therapies that prevent or reverse cancer in patients. Kerper’s research is focused on studying breast cancer in Kenyan women, a group of females who are prone to aggressive breast cancers in their teens and 20’s. 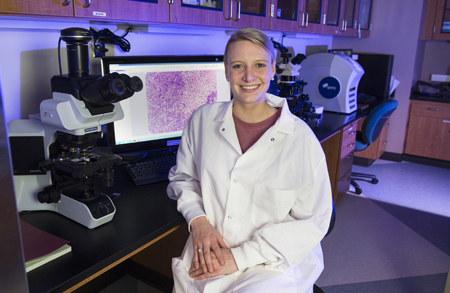 Using tissue samples brought to Notre Dame by Littlepage’s collaborators in Kenya, Kerper learned how to stain the samples to find various immunohistochemical markers and breast cancer clinical markers. By identifying relevant biomarkers and genetically sequencing the samples, the research team can begin to pinpoint the drivers of aggressive breast cancers and eventually treat them. In addition, the research group is looking at the immune response in the samples to determine which immune cells may potentially contribute to the progression of such aggressive tumors. To fund her research, Kerper has taken advantage of many programs available to undergraduates interested in pursuing scientific research. During the summer of 2013, she earned a College of Science Summer Undergraduate Research Fellowship (COS-SURF), which provided a summer stipend and funds for research supplies. Kerper presented the work she did that summer in San Diego at the American Association for Cancer Researchers National Conference in April 2014, which was funded by travel grants from the College of Science and the Biological Sciences Honors Program. In addition to COS-SURF, Kerper won a $12,500 research award through the inaugural Research Like a Champion competition in April 2014. The competition, open to all undergraduate and graduate students across the University, encourages students to submit innovative, interdisciplinary proposals for cancer research projects. “The award not only gave me the opportunity to stay in South Bend last summer to continue my Kenyan breast cancer project, but it also allowed me to purchase primary antibodies to explore different avenues with my project, such as staining the tissue samples for additional biomarkers that interested me,” she says. Kerper’s work has contributed to a paper that will be submitted by the Littlepage lab for publication and she will present her research findings during the fourth annual Harper Cancer Research Institute’s Research Day on April 16, 2015. Originally published by Stephanie Healey at science.nd.edu on February 24, 2015.